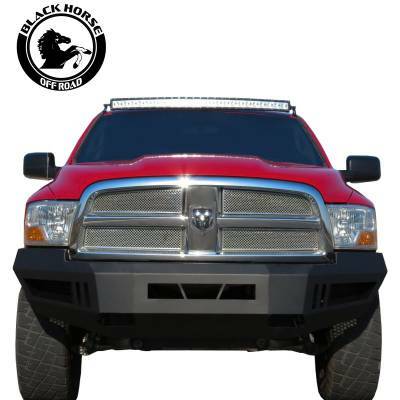 Armour Full Width Black Front HD Bumper by Black Horse(R). With 1 x 20" LED Light Bar and 2 x sets of Duallys Lights. Boost your off-road machine's front end protection to tackle the rugged trails and gnarly terrain with extra piece of mind by setting it with this top-end front bumper. Made to be tough as nails, this off-road bumper will keep your steel stallion safe from damage caused by flying rocks, deer, other vehicles, and everything in between while giving it a sharper look. Designed with the utmost care and attention to detail, this Black Horse's product ensures superior reliability. It provides long lasting and trouble-free service life.